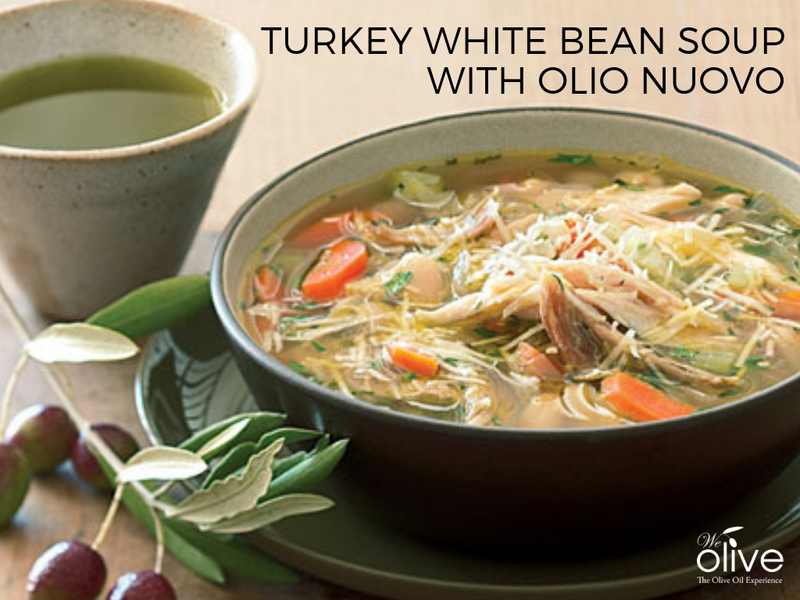 This soup from Sunset Magazine is the perfect way to reinvent leftover turkey into a delicious new meal AND enjoy your freshly milled Olio Nuovo. If you don’t have enough leftover turkey meat from Thanksgiving, you can supplement it with roasted turkey breast from a deli, or even shredded rotisserie chicken. Make stock: Peel and quarter 3 onions. Cut 3 celery stalks and 3 carrots into 1-in. lengths. Cut leeks (white and light green parts only) into 3/4-in. lengths, rinse thoroughly, and drain. Cut rosemary sprig in half. Divide cut-up vegetables, rosemary, thyme sprigs, parsley sprigs, bay leaves, 1 tsp. salt, the peppercorns, and turkey carcass between two 8-qt. pots (or use 1 very large pot). Add 20 cups cold water to each pot and bring almost to a boil over high heat. Just before stock reaches a boil, lower heat. Maintain a very gentle simmer for 4 hours, skimming off foam for the first 30 minutes. Strain stock through a colander into a large bowl. Wash pot and line colander with cheesecloth. Strain stock through cheesecloth-lined colander back into pot. Chill stock, covered, at least 5 hours or overnight. Skim fat from stock and discard. You should have at least 15 cups stock (if you don’t, add enough water to make up the difference). Make soup: Cut remaining 2 onions and remaining 4 celery stalks into 1/4-in. dice. Peel remaining 4 carrots, halve lengthwise, and slice 1/4 in. thick. Bring 15 cups stock (freeze any leftover for another use) to a simmer over medium-high heat. Heat extra-virgin olive oil in an 8-qt. pot over medium heat. Add diced onions, celery, and carrots, plus 1/2 tsp. each salt and pepper. Cook until vegetables are softened but not browned, about 20 minutes. Stir in garlic and chopped thyme and cook, stirring occasionally, 1 to 2 minutes, or until garlic is fragrant. Add hot stock and bring to a simmer. Stir in remaining 3/4 tsp. salt and 1/2 tsp. pepper. Add turkey meat and beans to soup and simmer until heated through, 2 to 3 minutes. Stir in chopped parsley. Add salt to taste. Serve soup in shallow bowls drizzled with olio nuovo and sprinkled with parmesan. Make ahead: Up to 3 months, frozen.